Thirty films is a tough list to narrow down. Really, the original is the best, and if you can only watch one Godzilla film before the release of Gareth Edwards‘ Godzilla, that should be it. That said, if you feel yourself craving a little bit more of the big G (yeah, that’s a fan nickname… just so cool right now), the following are my top five recommendations. Godzilla can barely contain all of his power in this movie. This is the movie (outside of the original) where Godzilla dies (spoiler alert). This was a huge deal back in 1995 and is still worth noting today. I remember hearing about this in the news – here in the United States. When else, outside of a Hollywood remake, has Godzilla made the American TV news? Remember, the internet wasn’t a thing back then so this is even bigger. It took me a couple years to track down a bootleg VHS copy, but it was worth the effort. Destroyah is actually created as a result of the oxygen destroyer. This ties into the first film and reinforces the theme that devastating weapons create devastating monsters. 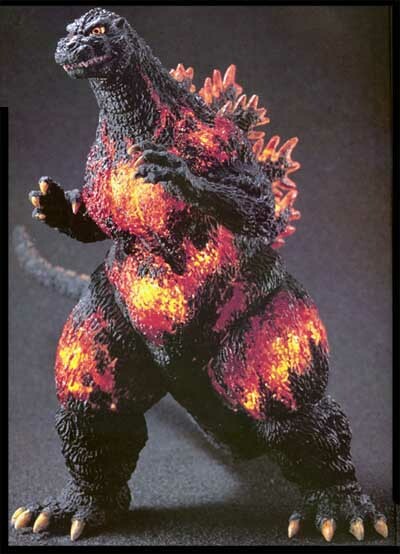 Godzilla vs. Destroyah features the excellent monster effects that highlight the Heisei series. Destroyah looks sinister, like Godzilla is fighting the giant monster version of the devil. The plot is also more interesting than most as the humans have to try and figure out how to survive Godzilla’s meltdown (he is dying from an overload of radioactive energy). There is one sequence in particular that sticks out in my mind: the humans fight a bunch of primitive-form Destroyahs in an industrial complex. They go in guns blazing but just get annihilated. If this sequence is sounding like something out of Aliens, that is because it is. Many of the Godzilla movies feature elements that are… let’s say similar to other culturally significant films. The better Godzilla movies incorporate those elements and make them fun. Godzilla vs. Destroyah accomplishes this well and is definitely worth the watch. The all white pupils make it one of his most striking incarnations. As stated previously, this is a film about allegory… however it is not just nuclear allegory this time. Godzilla represents the angry souls of all of those lost in World War II (this is stated in the movie rather than implied). 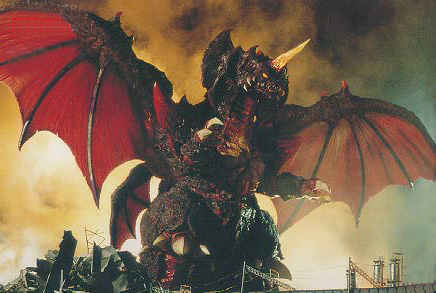 He has returned to wreak havoc on Japan and make sure that the people are reminded of the suffering that took place. Japan’s only hope, outside of the military, is three guardian monsters. Baragon, Mothra, and King Ghidorah must battle Godzilla and attempt to calm his fury before Japan is destroyed. Interesting note: this is the only time King Ghidorah is every portrayed as a good guy. Godzilla’s atomic breath leaves striking imagery in this film. If this movie is sounding weird, it is. It is also very well-filmed. The miniature and costume work are excellent, and there are several sequences that are very effectively directed. Godzilla is made terrifying again, and this is the only time since his creation that it works. Holy crap this movie! Made to celebrate Godzilla’s fiftieth anniversary, this film is a spiritual remake of Destroy All Monsters (1968). This film features fourteen monsters (14!) and has Godzilla just wade through a stream of enemies as he fights aliens that are attacking the Earth. This might be the most zany Godzilla movie ever made. The plot is this: Godzilla was locked in ice years ago and humanity has moved on, building advanced weapons to fight the other monsters on the planet. 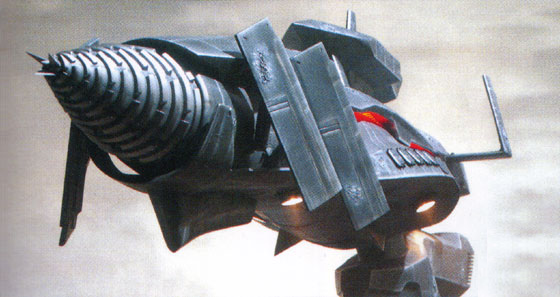 The greatest of these weapons is the Gotengo, a flying submarine with a drill on it… yep. Also, mutants have appeared, they’re just like people but more Matrix-y. This isn’t even every monster in the movie. Don’t let the title fool you, this is definitely a Godzilla movie. The fourth Showa movie is one of the best in terms of overall film quality. Director Ishiro Honda (the man who created Godzilla) crafts a very in-depth tale of Japan rebuilding in the wake of disaster. Capitalism is featured… and not overall favorably, as greed drives employers to value money over safety. The movie opens with a violent storm destroying a large portion of coastline. As the people sift through the wreckage, an enormous egg is discovered. An opportunistic businessman immediately seizes control and starts thinking up ways to use the egg to make money. Only one problem: it’s Mothra’s egg (giant moths lay eggs apparently). Oh, Godzilla also washed up as well. He isn’t discovered right away as he was buried by other debris but, he makes himself known fairly quickly. This Godzilla suit is regarded as one of the best in the series. 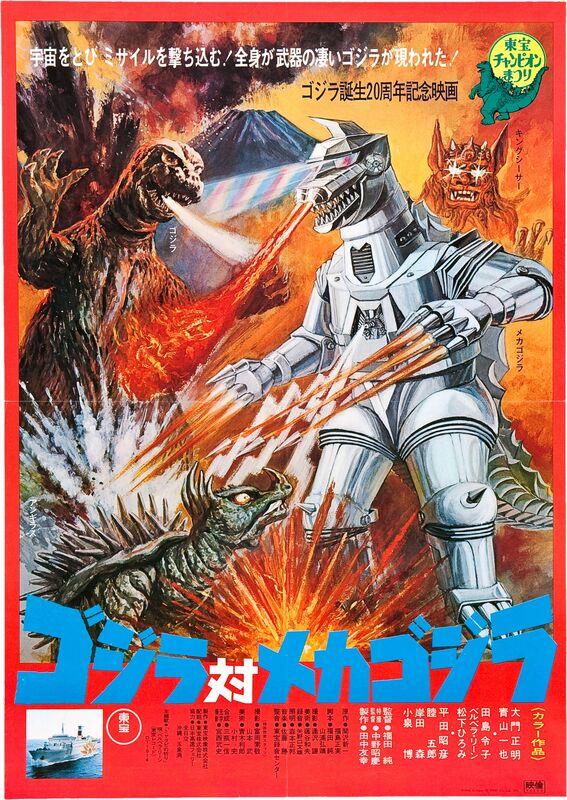 I may be biased here: this is the first Godzilla film that I ever saw. 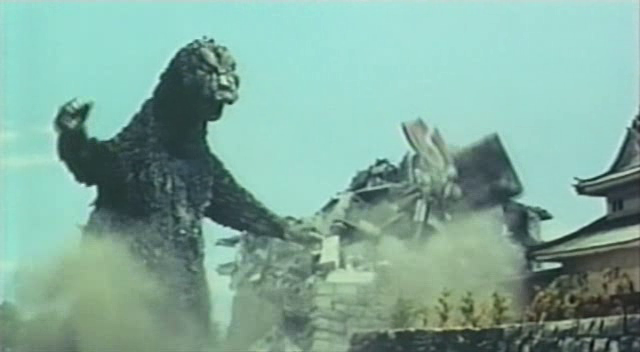 This was the fourteenth film in the Showa series and celebrated Godzilla’s twentieth birthday… by making him fight a giant, mechanized version of himself. One of Mechagodzilla’s many abilities. This movie is campy in the best way. I absolutely love it. So there you have it, five Godzilla movies that are worth checking out. If any out there manage to brave these selections and desire more, my runners up are as follows: Invasion of Astro Monster, Son of Godzilla, Destroy All Monsters, Godzilla vs. Megalon, and Godzilla vs. Biollante. If you feel like watching any more beyond those then do yourself a favor: take a month and watch a Godzilla movie a day. At least you’ll be able to cross that off the Bucket List once you’re done.